“Be who you are.” Sometimes that is so difficult. In a world that has rubrics for everything. You must look, act, dress a certain way. “Be who you are,” Jesus was. “Say what you feel.” I don’t think that Dr. Seuss is giving permission to be unkind, crude or rude, I think that he was saying that you are important and so are your feelings and sometimes you need to express yourself. The truth, always the truth. “Say what you feel,” Jesus did. “Those who mind don’t matter.” People who don’t allow you to be who you are or to say what you feel can be oppressive. We cannot let the bullies stop us from being the unique children of God that he created us to be. “Those who mind don’t matter,” Jesus did not allow those who disagreed with him stop him from following his Father’s will even if it meant his own death. “Those who matter don’t mind.” How blessed are we when we have people in our lives who love and accept us as we are. Truly a gift from above. How free it is to truly be yourself, to recognize the gift of being you. “Those who matter don’t mind,” we all matter to Jesus and slowly we come to know who he is and what he has done for us. I just love Dr. Seuss…don’t you? I love books that are for both children and adults. I love Dr. Seuss and remember his first book being read to me in first grade! That definitely shows how old I am. Acceptance is a great gift to those we meet and know–and don’t know yet. Dr. Seuss had such a way with words, what a master at crafting them. Is there any better feeling than that of being truly at ease with being one’s self. Ya, that is a pretty good feeling. I love the way he puts together words as well…what a gift. What wise words! And I enjoyed your interpretation. It has been awhile since I’ve read Dr. Seuss. I loved Horton Hears a Who in my childhood. I love those little ‘whos’. It does bring one back, but rest assured, they are timeless. I adore that Dr. Seuss quote! It is so comforting that I can be myself around those who matter! And they will love you for it….a great feeling indeed. This is a wonderful reflection. 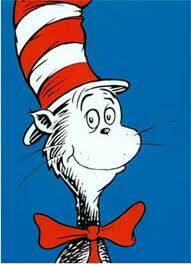 When my grandchild was young we would read Dr. Seuss books over and over. What wonderful memories and a great books to share with children, they are soooo deep. Great reflection, and I love that you started with Dr Seuss’ beautiful quote. Andie, thanks for stopping by my blog, and for your sweet comment. You’re most welcome Doris, and thank you for your visit here. It takes a long time, sometimes a lifetime, to be who we are, doesn’t it? I love the quote. Good thoughts Andie! Isn’t it amazing how much children’s books can teach us adults? I’ve been reading the Lorax (again and again) with my 5-year-old, and it’s been speaking volumes to me about stuff, and the nature of acquiring, and of course the whole green movement. Very cool. Wise words here, Andie..from you and the great Doctor! I love the Lorax. I have one in my office and it serves as a reminder to always speak for what is right and true. Thanks Michelle.